Using the PADI Scuba Tune Up Book, PADI ReActivate Touch (for tablets or mobile devices) or PADI ReActivate Online (for your personal computer), you’ll immerse yourself in dive scenarios and make decisions that test your understanding of important dive safety concepts, dive planning essentials and problem management. Move through the PADI Scuba Tune Up Book or ReActivate at your own pace and delve deeper into topics when you need or want to. 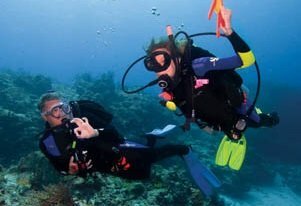 You’ll use Basic Scuba Gear including a mask, snorkel, fins, regulator, BCD and a scuba tank. The exposure protection you need will depend on whether you dive in a pool, confined water or open water dive site. Flatirons Scuba's staff will explain other equipment you may need to ReActivate. Any PADI certified diver who wants a refresher or pre-travel update should do a PADI Refresher. Dive shops appreciate seeing a recent ReActivate date on your certification card because it means you’re ready to dive in. Please download the below forms before your refresher class. These two forms, along with your certification card, need to be brought with you to participate in the Scuba Refresher. If you have any YES's on the medical statement portion of the Continuing Education Admin Form, you will need to have a doctors signature on the PADI Medical Form prior to class. This can be found below as well. We will need to have gear sizes prior to the refresher class.